Variety of colors. 3 Rigged Spider Jigs + 15 Extra Bodies + 6 Extra Heads. 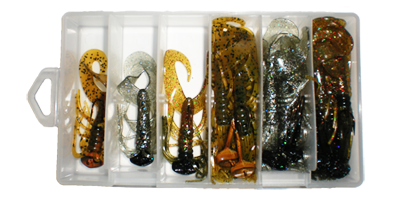 Comes in a 6 compartment reusable plastic tackle box! Attention California customers, Due to California state regulation (14 CCR) product and reusable kit boxes will be sold as separate products to customers in the state of California. Reusable containers can be purchased by clicking Kit Box and product to refill reusable container can be purchased by clicking Spider Jig.